In addition to steel and water, the Linssen family has snow in its blood. Every year, almost all of us depart for the French, Austrian or Swiss alps. This winter was no different. Our children learnt it at a very early age – just like me. I started skiing when I was three. Mathijs and Sophie too. I can now go downhill with Mathijs (6). We saw Sophie (3½), who started in December, during her last lesson on the slope, singing her head off. There’s nothing better than seeing your children when they are enthusiastic about something that you enjoy so much yourself. You also see that they are both mad about Switzerland. Mathijs, for instance, doesn’t eat a croissant for breakfast, but a Laugengipfel or a Laugenbrötchen. In the evening we don’t go to a restaurant, but to Ueli (the cook) and the ski school belongs to Hombi. In the meantime we drink a cup of coffee at Auntie Manda’s. But let’s get back to the water. Mathijs asks almost every day when can we go sailing again. Whether it’s raining, snowing, storming or freezing, he doesn’t mind. “It’s just great on the boat, mummy”. Exactly, come and say that to everybody who visits our showroom. “Ok, mummy”. And he’s right of course. Life on board is pure relaxation. “Just nice” as the kids would say. To really understand that, however, you must have experienced it yourself. Try it during one of our trial sailings. 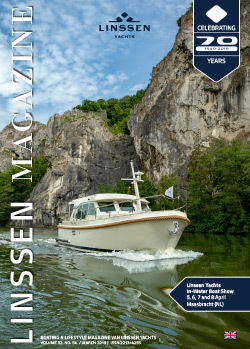 Or charter a boat perhaps from Linssen Boating Holidays. But best of all is on your own boat, equipped according to your wishes and at a time when it suits you, enjoying life on the water. Where and whenever you want. May we invite you to come and experience it with us? I hope to welcome you in our showroom, on the water, at one of our boat shows or perhaps prior to that on the ice in Friesland!